South Korean officials have said President Moon Jae-in could attend a possible summit between Donald Trump and Kim Jong-un. Any attendance by Mr Moon would be dependent on the progress of pre-summit talks between the US and North Korean leaders, said the Blue House. The historic meeting is scheduled to take place on 12 June in Singapore. It has been thrown into uncertainty, after Mr Trump said he would no longer be attending. But both sides have since been working to get it back on track. It would be the first ever meeting between a North Korean leader and a sitting US president. The details of the potential US-North Korea meeting remain unclear, but discussions would focus on ways of denuclearising the Korean peninsula and reducing tensions. 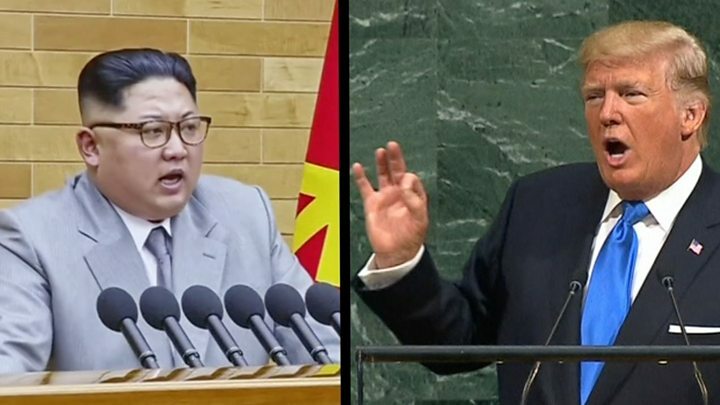 The US and North Korea have differed over the exact details of what “denuclearisation” would mean. Last week, Mr Trump said he was pulling out, blaming the North’s “open hostility”. It came after a senior North Korean official accused US Vice-President Mike Pence of making “stupid” comments..
Mr Pence had warned that North Korea “may end like Libya” – where then-leader Muammar Gaddafi was killed by rebels in 2011 after renouncing nuclear weapons eight years earlier. But Mr Trump later said the US was still talking to North Korea and the meeting could yet go ahead. On Sunday, Mr Trump said a team from the US had arrived in North Korea to make arrangements for the summit, which he said would help the North achieve its “brilliant potential”. Blue House officials said on Monday that discussions on Mr Moon’s potential involvement were at an early stage. “We are still waiting to see how they come out, but depending on their outcome, the president could join [Trump and Kim] in Singapore,” the official told news outlet Yonhap. Separately, Mr Kim and Mr Moon held a previously unannounced meeting on Saturday, following their groundbreaking meeting in April. 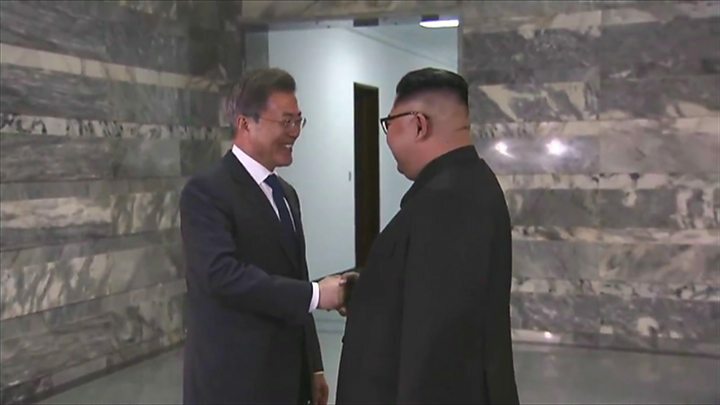 “Both leaders exchanged opinions… for the successful holding of the North Korea-US summit,” said Mr Moon’s office of the talks, which were held in the demilitarised zone, the border area between both countries.